Up until now, I’ve just been posting bits and pieces of what I’ve been working on any given day on this project; the following images are a chronology of the first few major stages my book illustrations go through. These are images of the major milestone stages – there is often a lot more work between these steps, depending on the illustration. This isn’t meant to be a how-to; every illustrator has their own way of working and their own process. Mine tends to involve a lot of redrawing and gradual tightening of the illustration. Perhaps not the most efficient way of producing a book and certainly not the quickest, but it’s what makes sense to me and is what I’m comfortable with. I like to have the drawings as right as I can get them within reason, before going to colour. Truthfully, I could redraw something forever and never be completely happy with it, but at some point it has to get ‘finished’. The steps below are repeated for all the spreads –this particular book has 17 spreads + a title page and cover. 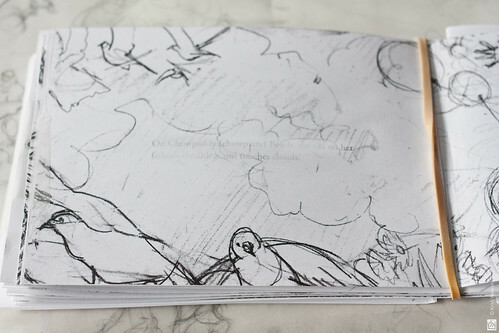 And maybe endpapers. The above is what I send to the publisher to get sign off. It’s really rough and not well drawn but expresses the major elements + characters in the composition and roughly where they, and the text, will be. These are small roughs done on printer paper. The smaller size is easier to handle (scan etc) and quicker to draw. What follows is a series of redraws until I’m happy (enough) with composition and elements. 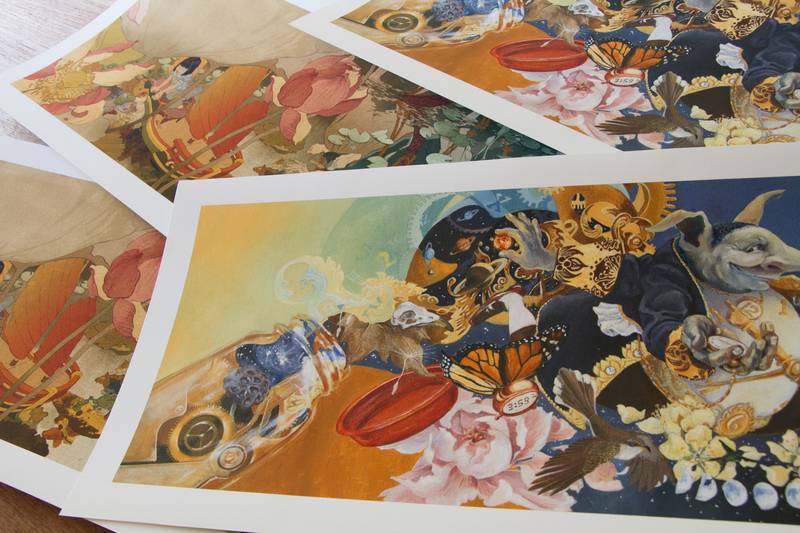 These are done at a larger size than the final print size because I’m more comfortable working in the details a little larger. When the pages are drawn at a size up from the earlier roughs, the compositions often fall apart, so sometimes things need to be shifted around a bit. When the drawings are tight enough (above), they are scanned, sized up, text + crops & gutter are dropped in for reference, and then printed. This ends up as the base for the next stage of drawings. There are often a lot of sketches and studies in between the previous stage and (above). Some pages offer more challenges than others and require more figuring to get compositions or elements right. 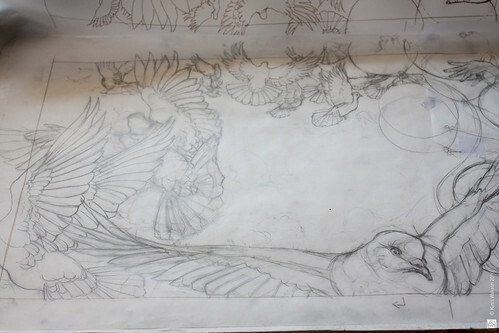 These last rough stages are all on tracing paper. next steps: final drawing + colour. But first, I need to finish the rest of the 17 spreads + cover & title page. It has been delightful to stumble upon your work. I am also an artist and I am so very impressed with your work and appreciate reading about your process. I am designing a story-telling mural and there were some great reminders for me about the steps of refining a good illustration. Thanks Gini! Good luck with the story-telling mural – sounds intriguing. 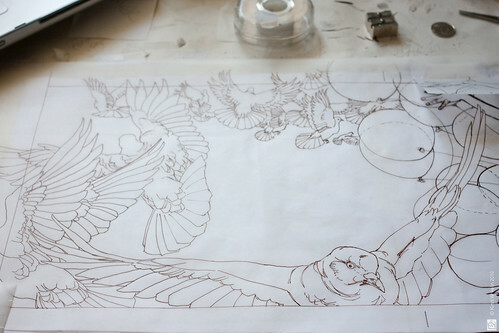 Why do you use tracing paper? Is it just a preference for does it contribute in some way to getting your final drawing done? I was very interested in seeing this, of course I have a few guesses, but I was hoping you could satisfy my curiosity… maybe it’s a common method among artists who’ve had professional training, but as I’ve never had any of that, and I’ve never seen it before, I hope you’ll bear with me if it’s a silly question. Nope, it’s not a silly question. I use tracing paper because I just find it easier to build my compositions; the paper is translucent so I don’t need a light table to make tracings. 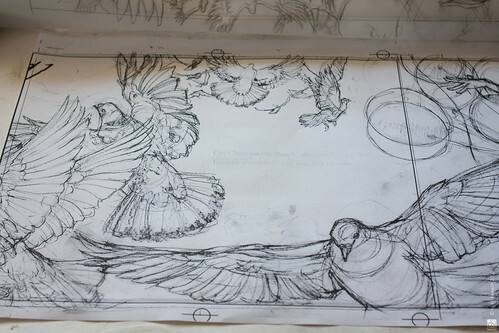 I usually do a very rough drawing first, then make a clean tracing on a new sheet for use as my final transfer drawing. I only wanted to thank you for your insights into your creative process. I intend one day to really go back to the drawing, but for now a thing called life still gets in the way. Meanwhile, it’s good to watch other amazing artists at work, I get inspired and it’s just simple visual delight. I’ve subscribed to your rss and I’ll be reading you faithfully. Keep up the great work and thank you for everything that you put in here. I’m glad you enjoy the posts here.